I just wanted to say a BIG thank you to all of you for your kindness and hospitality. The parade was an awesome experience. But cutting wheat on your farm on Len's combine was the thrill of my life. The lunch you prepared for Len, my family and I and my neighbor, Joel, was delicious. You all really went out of your way to make us all feel very welcome. I (and I know I speak for Len and the others) will never forget your kindness. 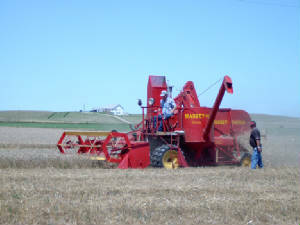 We finally finished our wheat and oats harvest on Tuesday. It was the longest, wettest, small grain harvest I can remember in my 36-years. And we only had just over 100 acres! Our wheat averaged 25 bushels per acre, and the oats much better, but the oats were so weedy that we had to combine around the weed patches. Now on to irrigating as it has been hot here. Temperatures only in the mid-90's, but the humidity as high as the tempurature. The livestock is panting - not used to this. As I was delivering the last load of wheat to the elevator on Monday or Tuesday, I met Len loaded up and on the move again with the combine on the Old Dodge. We both stuck our arms out the window and waved great big. I called him the next morning. He was at St. Paul, Nebraska. Didn't say where the next stop would be. When I met him on the road like that, it sure tugged at my heart strings. I too will never forget that weekend as long as I live. Don't why I get so sentimental over things like that. Just proves I was born too late I guess. Can't imagine looking back on this day and age in 50 years and calling this the good old days. Just not as much romance to these times I guess. Well, better get busy. We have a 4-H club calf workshop tomorrow at the fairgrounds. Will have to start irrigating at sun-up to make it there by 9 a.m. Thanks so much for the correspondence! Stay in touch and keep me updated on Len's journey. I probably won't call him too much as since the rain stopped, the work here on the farm has gotten busy. Kevin on the combine harvesting in his fields. Three of Joe Tucker's grandchildren with Len Holo. 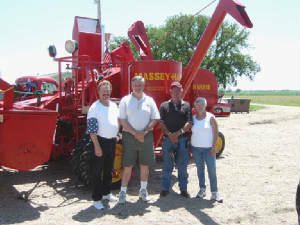 (l-r) Joseph Maxwell Tucker Springer, Joseph Maxwell Tucker II, Len, and Judy Tucker Horsch.